Khelte Khelte Uthbo Bere is a nice Bangla comics book which has an amazing Bangla story. 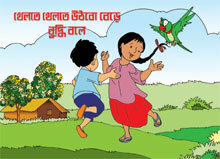 Meena, Raju, and Mithu or a parrot they are the main character in this Meena cartoon book. In this Bangla comic story, the main theme is needed for the quality education of a child and how is it possible? It is possible by giving chance a child for playing also. Play helps the student to use their creativity and that time it develops their imagination, physical and mental strength etc. In that story, the teacher said that play is important to healthy brain development. So, this Bangla comic book, you can now download as Meena cartoon pdf version and it is totally free. By the way, download the Bangla book i.e. Bangla comic book Khelte Khelte Uthbo Bere and read to enjoy! By the way, If you want to download and read the Bangla comics PDF titled Khelte Khelte Uthbo Bere- Bangla Meena Comics Book Download, You are required to click here!